Morality and values depend on the existence of conscious minds — and specifically on the fact that such minds can experience various forms of well-being and suffering in this universe. Conscious minds and their states are natural phenomena, fully constrained by the laws of the universe (whatever these turn out to be in the end). Therefore, questions of morality and values must have right and wrong answers that fall within the purview of science (in principle, if not in practice). Consequently, some people and cultures will be right (to a greater or lesser degree), and some will be wrong, with respect to what they deem important in life. First we should clarify that Harris asks us to start with a small assumption: that the greatest possible well-being for all human and animal life would be good, and the greatest possible misery for all human and animal life would be bad. This is a moral principle which, Harris admits, cannot be determined by science. It is determined by our intuitions. Yet any disagreement with this principle would be purely of a philosophical nature; everyone would agree intuitively. It would be only an arid intellectual exercise to disagree with it. The people of Albania have a venerable tradition of vendetta called Kanun: if a man commits a murder, his victim’s family can kill any one of his male relatives in reprisal. If a boy has the misfortune of being the son or brother of a murderer, he must spend his days and nights in hiding, forgoing a proper education, adequate health care, and the pleasures of a normal life. Untold numbers of Albanian men and boys live as prisoners of their homes even now. Can we say that the Albanians are morally wrong to have structured their society in this way? Is their tradition of blood feud a form of evil? Are their values inferior to our own [i.e., Western European values]? Though Harris does not elaborate further about the particular example of Kanun, from the rest of his book we can understand how science would proceed to evaluate it as a moral value: It would employ the technology of neuroimaging, directing that technology specifically at brain centres involved with the senses of well-being and of misery. If by luck scientists could find a culture identical to the Albanian culture Harris has described, but with one exception – the absence of Kanun – then those scientists would simply have to select a representative and statistically-significant sample of the citizens of each culture, study their brain activity to see which sample has a greater sense of well-being, and then declare that Kanun is or is not a worthy moral value. If scientists could not find such a similar culture, they would have to find ways to correct their findings for all the different variables, or would have to construct experimental situations. And of course neuroscience is not yet really so far advanced. But “in principle, if not in practice”, which is Harris’s argument, it should be possible for science to do all this. We sometimes hear that the customs and moral codes of one culture cannot be judged by the standards of another. But Harris would say that all customs and moral codes will have to be judged by the standard of well-being, as determined by science. How would Proutists say that we should determine that which is moral? Many Proutists take quite a different approach from the one that Harris recommends. While each of us as Proutists has his or her own conscience, developed to one extent or other through spiritual practices, we also think that the propounder of Prout had a far more developed conscience, such that we can rely on the moral principles that he taught and elaborated. consequentialist calculation. That is, we would not want to think that adherence to teachings stemming from a perfect intuition would not lead ultimately, as consequences, to the greatest possible well-being of humans, animals and plants. Another question, of course, that Proutists might ask about Harris’s approach would be: are all human and animal experiences of well-being and misery completely reducible to our physical brains, or is there at least brain activity that correlates with all such experiences? But perhaps this question is not really relevant. Though Harris is a neuroscientist and though all of his examples that seek to demonstrate the feasibility of his approach are examples of brain studies, his “central” argument does not completely depend on the reducibility of experience to the brain. His argument says: Conscious minds and their states are natural phenomena, fully constrained by the laws of the universe (whatever these turn out to be in the end). Proutists theorize that the mind includes more than just physical matter; that the deeper levels of the mind consist of substances more “subtle” than physical matter. But Proutists would not deny that those deeper levels operate “constrained by the laws of the universe”! To my knowledge Proutists might not even deny that, however subtle (immaterial) some levels of the mind may be, everything that we experience at least correlates in some way with brain activity and the crude matter of the brain. Some future science (even if it remains objective science only and not what Proutists call subjective science) may also be able to detect and measure feelings of well-being and misery even if they have no correlates in the brain. So personally, I am persuaded to a considerable extent by Harris’s argument. I am ready to think that, if the future development of science were to know no limits, men and women in white coats could make it clear to us, purely by studying the activities of the brain (and of any other possible structures whose activity correlates with our subjective experience), whether Kanun is a valuable custom or not; which wars are just; whether selfless service is a good thing to encourage; whether capital punishment should be practised or not; whether purdah is a socially healthy system; whether parents should spank their children when they misbehave; whether cartoons defaming religious figures should be protected by law; whether abortion should be legal or not; whether Facebook does more harm or good. To use Harris’s landscape metaphor, however (in which correct moral codes take us to the highest “peaks” on “the moral landscape”, while incorrect codes leave us short or even take us into valleys of misery), I would not agree that science can take us quite to the highest peaks. 1. Science is objective in viewpoint; therefore, though it may one day be able to fully measure someone’s subjective experience, it will not be able to share the subjective viewpoint of that experience nor hence any of the experience. In attempting to determine morality and values, this is a limitation that, because it is inherent in science by nature and definition, cannot be overcome by the ongoing development of science. 2. One consequence of said limitation is that science may be able to know everything objectively knowable concerning someone’s correct belief about X (that is, concerning someone’s “feeling of knowing,” or “ring of truth”, which happens to be correct, about X), without knowing whether the belief is correct. The person will know something about X, but science, absent other sources of information, won’t. 3. In the case of any object of human experience, science, with its objective viewpoint, can give us, as scientists’ students or audience, a representation of the object (including a simulation), and the representation may be better for some purposes than the direct experience; but science cannot give us as students or audience the direct experience. I think that at least the first two of these points limit science in the determination of values. It is correctly assumed that well-being is good (the highest value) and suffering is bad. Let us accept the assumption also that each is based in brain or other events that are scientifically measurable, and that are evaluable in terms of well-being to an important extent. But is there also an extent to which even after precise measurement, the events, particularly those underlying the highest levels of well-being, will not be scientifically evaluable?
. . . solitary confinement . . . is considered a punishment even inside a prison. . . . And yet, for thousands of years, contemplatives have claimed to find extraordinary depths of psychological well-being while spending vast stretches of time in total isolation. . . . there is no question in my mind that people have improved their emotional lives . . . through . . . practices like meditation.
. . . our habitual identification with discursive thought, our failure moment to moment to recognize thoughts as thoughts, is a primary source of human suffering. And when a person breaks this spell, an extraordinary kind of relief is available.
. . . Another common mistake is to imagine that such experiences are necessarily equivalent to states of mind with which many of us are already familiar – the feeling of scientific awe, or ordinary states of aesthetic appreciation, artistic inspiration, etc. Harris doesn’t quite say that meditation experiences are better than The Good Life or scientific awe, etc., but his explanation here of how identification with thought is a primary source of suffering makes that at least a high probability, which any proposed method of maximizing human well-being will have to encompass. He does not come as close to identifying any other single variable as the source of the greatest well-being, as he does meditation. Thus it is quite persuasive when Harris says that some people who spend decades on retreat meditating become “true saints,” or “spiritual geniuses.” So let us suppose there is an individual whom we can call Saint Well-Being (W-B) who experiences greater well-being than anyone else on earth. We are all “far more similar than we are different;” we all have potential somewhat similar to that of W-B; so clearly one component of the endeavour to effect the maximum overall well-being must be that science identify W-B and recognize his/her well-being as the highest known human value on the individual level; and then that many, if not all, of the rest of us learn the meditation techniques, lifestyle and code of morality that have worked for W- B. However, Harris has said: “the sciences of mind are largely predicated on [correlating] first-person reports of subjective experience with third-person states of the brain.” “Third- person states of the brain” means states of the brain of a subject that can be observed and certified by researchers in white coats. Researchers may eventually be able to objectively know everything about W-B’s brain states, but they will know that his/her brain states represent the greatest subjective well-being on the planet only if they believe his/her first-person report to that effect. They can confidently accept similar reports of lower levels of well-being correlating with other brain states in other subjects, because 1) numerous subjects with almost-identical brain states have reported the same levels; and 2) the lower levels may be within the researchers’ own range of experience, and they may have measured their own brain states. But W-B may be one of a kind in terms of potential human well-being achieved. Having failed to confirm W-B’s spiritual genius by the only direct means science has of “referring to a person’s subjective experience” (the correlation of first-person with third- person), researchers will fall back on an approach suggested by a remark of Harris’s: “if Jesus was a spiritual genius, you know, a palpably non-neurotic and charismatic and wise person, I can well imagine the experience of his disciples. I can well imagine the kind of influence he could have on their lives . . .” Traditionally, W-B’s, along with their moral authority, have been identified by the intuitions of others: “He/she seems to have found something.” And science will try to provide scientific confirmation that W-B’s disciples are correct in identifying W-B as a spiritual genius. However, as we have seen in 2 above regarding correct beliefs, “The person will know something about X, but science, absent other sources of information, won’t.” Suppose I have a particular intuition, I1, about some person. Suppose that that intuition is correct. Suppose also that I have another intuition, I2, which is the intuition that I1 is correct; and suppose that I2 is also correct. I2 is an experience. I2 is correct, but how can science know that I2 is correct? To science, my I2 is a measurable sense of correctness, but the sense itself remains subjective: I have the experience; science knows I have the experience, but science doesn’t have the experience. So science doesn’t experience, and therefore doesn’t know, the correctness of I1. So science will not be able to help with this indispensable element of achieving the greatest well-being for all: identifying the W-B’s if few – especially if their well-being continues to evolve. 1 A term used by neurologist Robert Burton, quoted in The Moral Landscape hardcover, p. 127. Burton has said that a feeling of truth is simply a neurological event that may have little relation to the actual truth. An example might be that most of us have a feeling of truth that red means stop and green means go; but if any of us were to be bumped on the head, we might develop an identical feeling of truth about the opposite idea. 2 The Moral Landscape hardcover, p. 15. 5 The Moral Landscape hardcover, p. 190. Shame, regret, then judgement one traps inside a physical relm of belief in personal conduct and a right to uphold an individual pride clouded in circumstances of inflictions surrounds a shallow surfaced ideal develops a cycle in do harm? Ultimately measuring the full weight with the use of numbers in a mathematical pattern of profound pain in unrestricted proportions? Halt the ability to think ahead towards uncharted territority and seek the inner stability to follow ones own Devine thought? Moral value determines upon a view and anything may decide to lean one way or the other, good or bad. What code stipulates the path? We tip along the scale of life through the experiences of others from one point or another. Certainly, I agree that science alone will not bring complete understanding of the vast unknown but this uncertainty brings an eliminate of surprise because when one finds treasures amongst hidden leaves, a forest of new formulations may emerge to ultimately merge a connection of a previous discovery, unity. 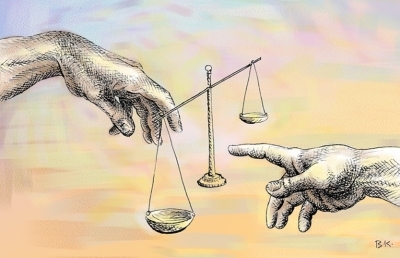 Understanding the law of Karma may help in this scientific debate. Knowing that every action has an equal and opposite reaction given that the circumstances of time place and peron are the same can give clues as to what to do in various moral dilemmas. Another factor is the understanding of progress in a spiritual sense when we talk of the greatest possible well-being. For example a case of murder would mean the one perpetrating the murder having to experience the same reaction he/she caused. If that can be done mentally and emotionally and a recognition of the mistake through repentance has occured, there is no need to kill that individual because that would mean another life lost, when he/she could simply be made conscious and use his/her energy to compensate the loss of life with all its consequences. Then comes the why and how of the circumstances. Surely it can be put into a computer and we would determine the exact procedure to correct the person. Neither any amount of principles or laws or intuition can ever be perfect and an ultimate factor to consider would be the cultural context in terms of what means what and where. I have heard that stories for movies are made out of computers nowadays already with all its emotional and other contexts. All that is done is to provide new facts and backgrounds and a general outcome of the movie and computers can make a story. For me that is scientific enough so that we can go in that direction without a doubt. We ought to spend much more energy in the near future on moral education because the technical progress is so dramatic that mental weaknesses allow huge resources to be misused with consequences for thousands of years to come. When time is short and not enough for education only fear and threats can guarantee moral behavior (that also has its karmic consequence). When time is given for adequate experiences and strengthening of character, each one of us can learn and be taught properly as it should be done from the beginning with foresight of all the possible responsibilities we could come across. In any case a big topic and for me definitely scientific. Were the laws of karma properly explained in an Albanian context, surely they themselves would come to different conclusions. Maybe their concept of punishemnt in a murder was put into place to create fear at a certain time in history when it was necessary to make such a rule in the interest of the greater good which may not be necessary today anymore, but often times when we analyse such cases in neo-humanistic light we might find out a hidden selfish motive behind it.